Since holiday party season is in full swing, we thought we’d share our recommendation for white elephant gift giving this year. $15 seems to be a common limit for many of these games, so we’ve tried to pack as much punch as possible for that amount. Let me start by saying that white elephant gift giving can be tricky. Too kitschy, and everyone who put hours of effort finding the nicest gift possible within the budget will feel insulted. Too swanky, and guests with the more “creative” gifts will feel like you’ve made a corporate mockery of the game. To top things off, there is always the equally touchy topic of gender neutrality. 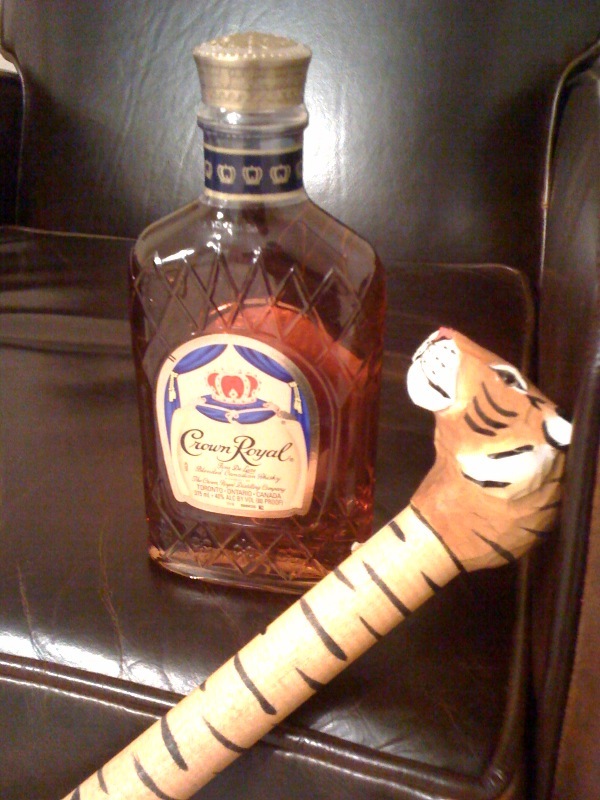 We’ve taken all of these considerations into account and we recommend… the Tiger Cane & Crown combo! The timeless wooden tiger cane is available for $6.49 at World Market (on sale from $12.99), and we found a 375ml bottle of Crown Royal at a local liquor store for $9.99 (holiday special); adding up to a grand total of $16.48 (everyone goes over). With a retail value of around $25, you’ll be bringing more than your fair share of value to the party. So, if you feel like giving a white elephant gift with priceless class, infinite possibilities, and maximum value, give this combo a shot. Caveat: This gift is difficult to wrap. This entry was posted in Gifts, Vices and tagged cane, crown, gift, holidays, parties, tiger. Bookmark the permalink. The gift may be difficult to wrap, but if done correctly it will look like a stick horse. And who wouldn’t want a stick hores for Christmas. Better yet, forget the Crown and Cane, go for a stick horse!!!! Seriously though, the Crown = Good. Cane? Can you hide your shiv or a sword inside? I know you have to fill out that $15 bro, but you can find something better than a plastic cane… Right?